Emerging Arts Professionals (EAP) 2011-12 Fellow Katie Fahey opened the Equity in Placemaking session at the Emergence annual convening on June 4, 2012, by explaining that there is a consensus surrounding the term placemaking. In my mind, I’m thinking, “A general consensus among whom?’ By the end of the session it was clear that placemaking was still trying to find its “place” in the disparate worlds of arts and urban planning. Even after the question and answer period, it was apparent that each of us has our own understanding of the meaning of placemaking. Where does cultural competency fit into placemaking? What are the demands and roles of artists in placemaking? How do community revitalization and nonprofit efforts relate to placemaking? When questioned about her experience as an administrator with Pro Arts and Rock Paper Scissors Collective, Canton Titus exposed our relationship to art and place. You have to have the time, the money, and the space/place to create art, which is a privilege. As one audience member sought understanding, she shared with us Wikipedia’s version of cultural competency. 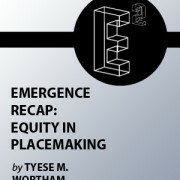 She further added that race and class seem to be the underlying issues of placemaking. Audience member (and keynote panelist of another session) Ann Markusen passionately explained that her understanding of the session revolved around the inequity in placemaking for community arts organizations. Markusen sparked a brewing conversation specific to gentrification, privilege, race, and class. Why do we arts professionals continuously forget to include privilege in the conversation? How do we discuss placemaking, neighborhood revitalization, or community development without understanding cultural competency and first addressing race and class? With her background in community and economic development, Karen Chapple clearly laid out three examples of the varied perspectives and values of the artist and planner. Considering outcomes, Chapple asks how equitable are these models, whom do they (really) serve, and are they sustainable? She calls the Berkeley Arts District the “trickle down” equity model. The hope? The benefits of building an arts district would eventually “trickle down” to artists. The “equitable moment” model exemplifies Oakland’s Uptown/Art Murmur. Though the neighborhood/arts district is thriving culturally, artistically, and economically at this moment, over time sustainability is a concern. With built in equitable mechanisms and community benefits in place, Chapple considers the Mid-Market Arts District of San Francisco as the “equity-for-the-few” model. Businesses, artists, and community arts organizations seem to be at the mercy of the City Administrator, still creating winners and losers. Though Chapple questions who is really being served, it is clear that the focus of this session is limited to the relationship between the planner and the artist. Is it not our responsibility as administrators to include our neighborhoods and local residents in the conversation of placemaking as equal partners? Can a city planning language on the role of the arts in urban vitalization be joined to an artistic language of social engagement in the arts? As more artists begin to identify themselves as “research-based” artists, how can urban planning research be conducted as part of the art process itself? Can the Creative Class discourse think more about class difference? How can equity in ‘placemaking’ also mean equity among arts organizations? I see the importance of forming a common language and validating the artistic process as “research.” Can we also address the accessibility of the discourse? How can we create language that is inclusive for all stakeholders? How are arts districts being evaluated? Culturally? Economically? Which metrics are being used to measure outcomes? Which communities are being served? What is the role of neighborhoods in placemaking? All of these questions were touched upon in some form throughout the session. I appreciated Chapple’s suggestion of using Northern California Community Loan Fund as a resource. She said it was important to think about shared spaces, such as schools and churches, to generate revenue for neighborhood-based spaces and to create natural collaborations. 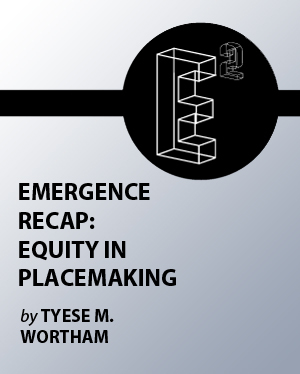 What is equity in placemaking to you? It is possible that this session has left us all with many unanswered questions. Placemaking is a new concept for study and exploration but has been occurring for years. Several conversations are taking place and considering the various viewpoints of placemaking as well as each individual’s PLACE in privilege. For me, you cannot speak of placemaking without addressing the challenging issues of race, class, and culture. Is placemaking not a new, fancy, PC, feel-good term for neighborhood revitalization, gentrification, and community development? You tell me. How do you define placemaking? Where is placemaking taking place in your city or town? What are the costs and benefits of placemaking? Where is your PLACE in privilege? As a passionate and community-based administrator, artist, and teacher, Tyese M. Wortham aspires to accomplish two goals as part of her lifework: First, she strives to advance the presentation, preservation, and innovation of local artists’ traditions and art forms. Secondly, Tyese strives to increase the presence of arts administrators of color. She has acquired over 20 years of dance experience from hip-hop to modern, from West African to Afro-Cuban. Currently, Tyese is a principal dancer with Emesè: Messengers of the African Diaspora and De Rompe Y Raja Cultural Association. She has had the pleasure and honor of working closely with her teachers and mentors: José Francisco Barroso, Carlos Carvajal, Teresita Dome-Pérez, CK Ladzekpo, and Gabriela Shiroma. Tyese has served as a program manager, panelist, consultant, facilitator, and committee member for various Bay Area arts organizations including San Francisco Ethnic Dance Festival, Arts Council Silicon Valley, San Francisco Carnaval, Alliance for California Traditional Arts, Dance Discourse Project, Black Choreographers Festival, and the Isadora Duncan Dance Awards. Feel free to reach out if you have any questions. Emerging Arts Professionals/SFBA is a network focused on empowerment, leadership, and growth of next generation arts and culture workers in the San Francisco Bay Area through knowledge sharing, learning opportunities, and partnerships. By supporting today’s emerging models and mindsets, we hope to generate a path for individuals’ meaningful and sustainable work and to stimulate a vibrant, integrated, and evolving arts and culture sector.